Trying to get back to a semi normal life after the stroke. I have recovered phenomally fast, with just a little problem in my left hand. Now wanting to restart my blog and get into action. 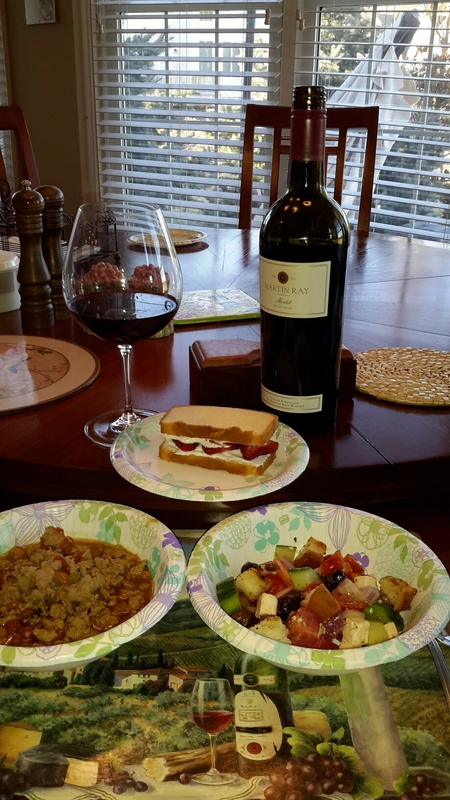 So with a little help from my daughter and sister, we prepared a wonderful meal complete with a very tasty merlot. Starting with the panzanella salad, tomatoes, onions, two kinds of peppers, olives, feta cheese and handmade croutons. Dressed in Italian dressing and left to marinate all afternoon, healthy and tasty. The main course was HRS sweet and spicy chili. This concoction is something my daughter came up with. Tonight we use ground turkey . Sautee an onion in olive oil, then add the turkey, brown ( or cook till done since turkey doesn’t really brown) then add garlic, salt and pepper to taste. After this add chili powder, then adobe pepper, cumin, and water, all of this is to your own taste and consistency. We like it spicy and have been known to add chopped jalapeños. Once you have it spicy you then add the special ingredient, a can of pork and beans. Yes, pork and beans, the sweetness of the beans and spiciness of the chili is just to die for. Dessert tonight is a srawberry sandwich. A cold pound cake sliced into thin slices. The center is a package of cream cheese, 2 cups of powdered sugar blended together when the cheese is soft. You spread this mixture on one slice then add sliced strawberries and another slice of pound cake. Not a bad meal for a day out of rehab. I added to 2011 Martin Ray Merlot Napa. A delicious addition to any meal The bouquet erupts with aromas of cherrry, and a fresh field of flowers. The mouth is just full flavor forward, cherry, oak and spice mix together perfectly to give a wonderful oral experience. The end is long and the fruit stays with you, soft elegant tannins finish you off. Bonus is a s recap, you know easy to open after a stroke. Paper plates and all, easy delicious meal.